Susie Nadine Hairston Harper, age 79 of Danville, VA went to be with her Lord and Savior Monday, November 12, 2018 at Sovah Health of Danville. She was born August 26, 1939 in Pittsylvania County to the late Theodore Hairston and the late Jessie Mae Wilson Hairston. Susie was married to Willie Lewis Harper, Jr. who survives. She was a member of Mt. Carmel Baptist Church. In addition to her husband she is survived by three daughters, Leslie T. Harper of Richmond, VA, Pamela A. Long and husband William of Danville, VA and Kimberly Paschal and husband Gil of Danville, VA; three sons, Reginald L. Harper, Rodney L. Harper and Christopher L Harper and wife Penny all of Danville, VA; a brother, William Hairston; six grandchildren, four great-grandchildren and a host of nieces, nephews, family and friends. In addition to her parents she was predeceased by three children, three brothers and five sisters. Funeral services will be held 2:00 p.m., Saturday, November 17, 2018 at Norris Funeral Services, Inc., West End Chapel, 511 Church Ave., Danville, VA 24541 with Minister Renee Hughes officiating and Minister Rodney Harper will do the eulogy. Interment will follow at Danville Memorial Gardens, Danville, VA. The family will receive friends 6:00 p.m. till 7:30 p.m., Friday, November 16, 2018 at Norris Funeral Services, Inc., West End Chapel. Norris Funeral Services, Inc. and Crematory, West End Chapel, 511 Church Ave. Danville is serving the Harper family. Online condolences may be made at www.norrisfuneral.com. 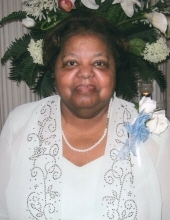 To send flowers or a remembrance gift to the family of Susie Nadine Hairston Harper, please visit our Tribute Store. "Email Address" would like to share the life celebration of Susie Nadine Hairston Harper. Click on the "link" to go to share a favorite memory or leave a condolence message for the family.